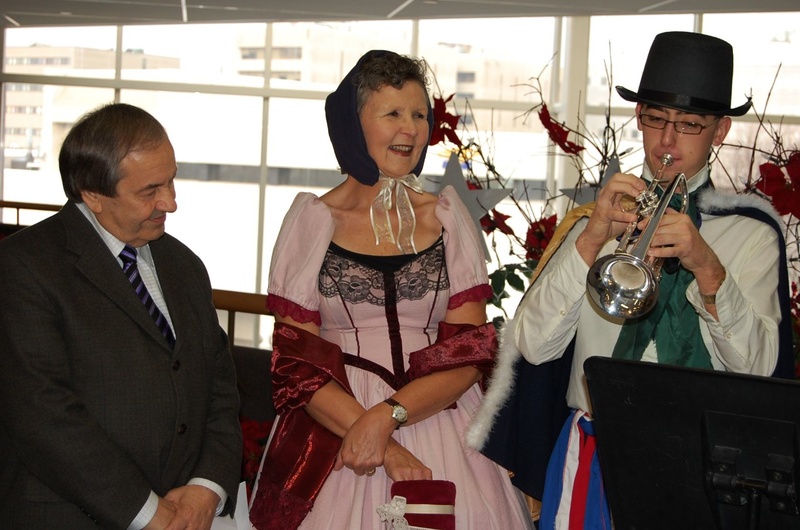 Mayor John Rodriguez proclaims December 7 to 13, 2009 as Charles Dickens Week in the City of Greater Sudbury. 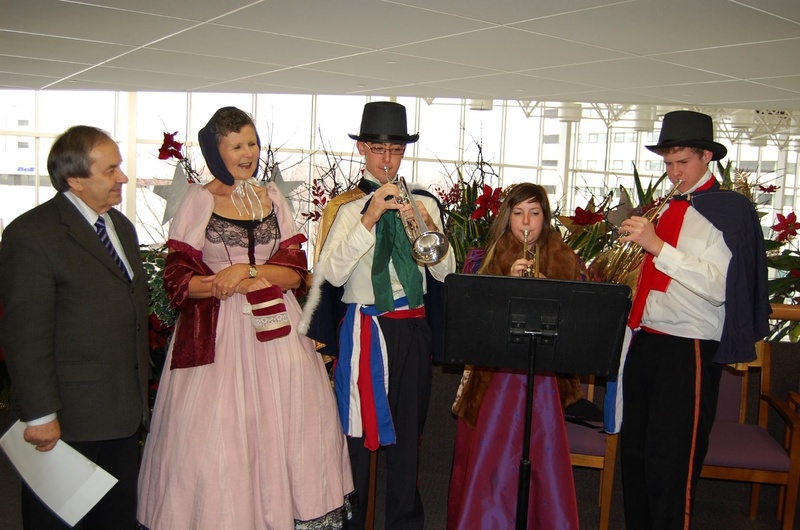 To mark the occasion, Rainbow District School Board Director of Education Jean Hanson and Sudbury Secondary School music students Thomas Flake, left, Teal Corelli, and Mitchell McIntyre assembled at City Hall dressed in period costume in the spirit of Dickens’ literary characters. The week will culminate with a dramatic reading of A Christmas Carol on Sunday, December 13, 2009 at 7 pm in the Sheridan Auditorium at Sudbury Secondary School, 85 Mackenzie Street. All proceeds will support the Joan Mantle Music Trust. 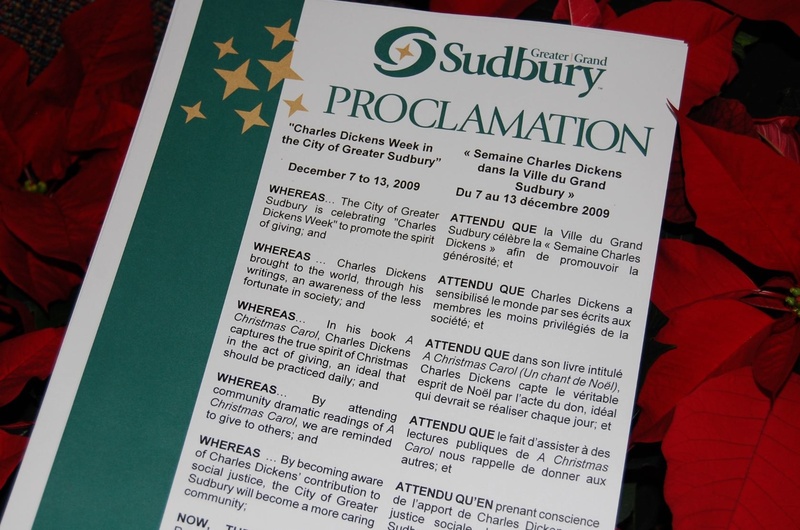 To promote the spirit of giving, Greater Sudbury Mayor John Rodriguez has proclaimed December 7 to 13, 2009 as Charles Dickens Week in the City of Greater Sudbury. To mark the occasion, Rainbow District School Board Director of Education Jean Hanson and Sudbury Secondary School music students Thomas Flake, Teal Corelli, and Mitchell McIntyre assembled at City Hall on Wednesday, December 2, 2009, dressed in period costume in the spirit of Dickens’ literary characters. Charles Dickens brought to the world, through his writings, an awareness of the less fortunate in society. In his book A Christmas Carol, Charles Dickens captures the true spirit of Christmas in the act of giving, an ideal that should be practiced daily. The week will culminate with a dramatic reading of A Christmas Carol on Sunday, December 13, 2009. The presentation will take place in the Sheridan Auditorium at Sudbury Secondary School, 85 Mackenzie Street, at 7 pm. All proceeds will support the Joan Mantle Music Trust. Admission is $10 for adults, $5 for students and $20 for a family. Tickets are available at Sudbury Secondary School, Lo-Ellen Park Secondary School, Lockerby Composite School, Lasalle Secondary School, Black Cat on Durham Street and Jett Landry Music on Lasalle Blvd. The presentation will feature excerpts from A Christmas Carol read by CBC Morning North Host Markus Schwabe; Northern Ontario Business Publisher Patricia Mills; Greater Sudbury Police Chief Frank Elsner; Laurentian University President Dominic Giroux; and Rainbow District School Board Director of Education Jean Hanson. In addition to the dramatic reading, the evening will showcase talented music students from several Rainbow Schools. Performers include the Sudbury Secondary School brass ensemble, the Lo-Ellen Park Secondary School woodwind ensemble, the Lasalle Secondary School bluegrass duo, and the Lockerby Composite School jazz combo. The Joan Mantle Music Trust was established last fall to help refresh, modernize and revitalize secondary school music programs in the Rainbow District School Board. It is the goal of the Trust, with the generosity of the community, to replace, where necessary, musical instruments that have given such great pleasure beyond their serviceable life. The Joan Mantle Music Trust allocates funds to secondary school music programs in Rainbow District School Board, one school at a time. This ensures that there is a tangible improvement in the condition of equipment in an entire department, allowing students to achieve more in their musical studies together.